Despite numerous developmental interventions over last few decades, many groups in Gilgit-Baltistan are still socio-economically vulnerable. Physical isolation and limited employment/economic opportunities due to absence of an industrial base remain core developmental issues of the region. Although, the overall literacy rate is higher as compared to other regions of Pakistan, access to higher education remains drastically lower at the peripheries of Gilgit-Baltistan. Also, the numbers of school dropouts are increasing day by day due to i) financial constrains ii) decrease in disposable income over the years iii)absence of educational institutions in the far flung areas and iv) lack of awareness. Agriculture is the primary source of livelihood and subsistence apart from limited economic opportunities in public and private sectors but the average landholding is decreasing due to a rapid population boom. It was imperative to design a project specifically considering youth budge for the unemployed and semi-skilled workforce for overall socio-economic growth of the region. Feeling the lacunae of the situation, Rupani Foundation in partnership with Deutsche Gesellschaft für Internationale Zusammenarbeit (GIZ) launched a project in stone masonry to support labour markets in the region as a component of the TVET Reform Support Programme which co-funded by the European Union, the Embassy of the Kingdom of the Netherlands and the Federal Republic of Germany. 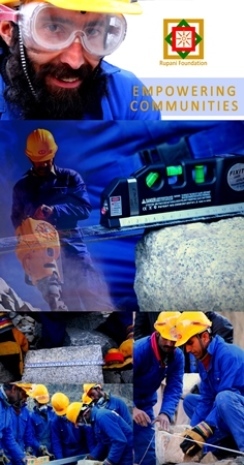 The specific objective of stone masonry project is to support and promote stone craft through structured training, technology transfer and market development by imparting skills in stone dressing and fixing on standard construction codes in district Gilgit, Hunza and Ghizer of Gilgit-Baltistan. Project is specifically designed for school dropouts and masons who are already associated with stone masonry in order to facilitate overall growth of this trade in Gilgit-Baltistan. By the end of this project, Rupani Foundation will forward basic and advanced level trainings to 1500 individuals in stone masonry and quarrying techniques.The project focuses on remote regions of Gilgit-Baltistan specifically those which had been previously remained deprive of development sector intervention. The reliance on traditional economic activities such as agriculture and horticulture is decreasing day by day due to rapid population growth. Through skill development trainings in Stone Masonry and Quarrying, the project intends to build new economic resorts for marginalized and vulnerable sections of the society. It is a vital support for the poor and vulnerable members of Gilgit-Baltistan to enhance participation in mainstream economic activities. This increased participation in economic activities would both benefit micro-level and macro-level economic growth. Labour sector had not been yet formalized in this region that’s why individuals lack necessary awareness regarding their rights and powers. Also, in absence of combined platforms, interest groups and associations, people associate with any particular trade lack networking and market linkages. That is why Rupani Foundation has established a registered regional stone masonry association for the critical mass trained by the project. Also, though this project, Rupani Foundation has developed this website for the masonry association in order to connect the workforce with local, regional and national markets. A registered entity like Gilgit-Baltistan Stone Masonry Association on one hand would enable masses of same trade to interact with each other for defining collective goals and rights, while on the other hand it would facilitate them to hunt new economic and employment opportunities on a larger scale. Training in stone masonry in Gilgit-Baltistan is an elaborately designed project extending from skill development through structured training to job placements in the market. It would be a hallmark for future developmental interventions and activities. This project would guide future policy environment for the development sector institutions to develop and design skill developmental programs for market-oriented professions.